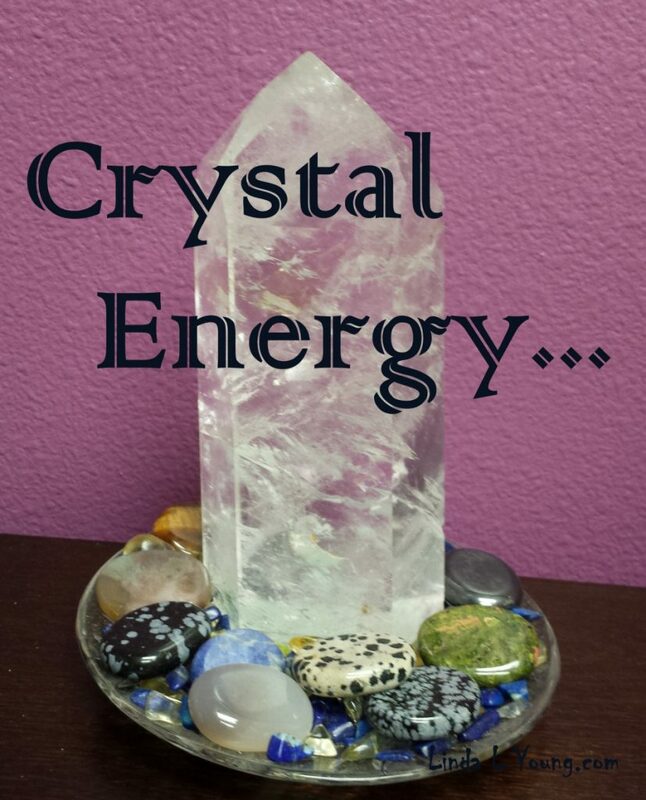 What is Crystal Energy? It is the energy radiating out from crystals, or other precious objects and stones. There are many various types of crystals and the energy they give out is different for each one. The crystal pictured here is called a “fire and ice” crystal. It is a highly desired form of quartz, that is known for uplifting, refined, exciting energy. The smaller tumbled stones surrounding the large crystal help to balance the strong, vibrant energy the large crystal radiates. They help to promote grounding and balance, soothing rough emotions and bring the feeling of peace and harmony. They are “energy balancing” stones. Some of my favorite balancing stones are agate, jasper, jade, and obsidian. Rose quartz is also a favorite. It is known to promote and embody love. It feels very warm and inviting, and is some form and shade of pink or rose color. Often the more intense the color is, the more intense the vibration radiating from it is. For example, a soft rose quartz will give you a softer feeling or vibration of love than a brighter, denser, intensely colored one. So much of the feeling you get from a crystal depends on the mood or state of mind that you are currently in. Current circumstances definitely influence how a crystal effects every part of you, and whether you allow or reject it’s energy is totally up to you. Some people are also more sensitive to outside influences like crystals than others. These people are often referred to as empath’s or a person that is empathetic to their surroundings or other people. They take on the feelings of others and can actually feel what others are feeling. Sometimes it is nice to have a “guard” stone to help keep other people’s negative feelings away from you if you tend to be an empathetic person. Crystals like purple amethyst are especially good for this purpose. They help protect and guard against energy bombardment, and promote peace and harmony. I like to keep one of these in my pocket every day. It helps me stay focused and balanced while working with and around other people that have fluxuating energy patterns. Crystals can also heighten or intensify your intuitive qualities. Some crystals are known for their properties of increasing intuition. Bright, clear crystals promote bright, clear thinking and acting. They help you relate to and interpret your own intuition and circumstances. Other crystals like smokey quartz can help absorb emotions and feelings from you and the atmosphere around you. It is a soothing all around feel good type of crystal with many uses. Whatever crystal catches your eye, or draws you to it, just take a look at it for a while and absorb some of it’s it’s energy to see if it is the one that resonates the best with you right now, meeting what ever need you have, sharing it’s energy with you. Oh hi ?I just wanted to Thank You for posting this it’s just Great n Z HAPPY Mothers Day ??? ?Sending much LOVE n HAPPYNESS ?? ?THANKS Again Linda.?? ?